I was really proud to have Antonio Segura Donat, better known as Dulk, as 2017's Dirtybird Artist-In-Residence. 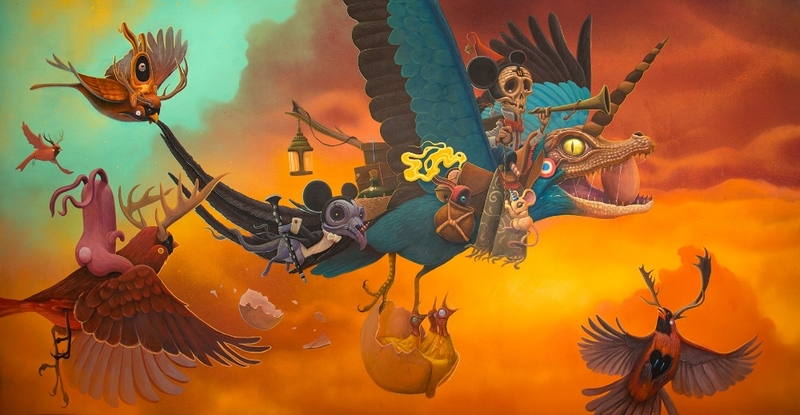 The Spanish painter, illustrator, sculptor and street artist has been on a steep rise lately, and I'm a huge fan of his pop surrealist style, off-kilter visions of animals and use of vivid colors. I somehow got Antonio to agree to spend over a week at my house creating one of the largest paintings of his career: an incredible 10'x3' piece called "Thieves". As his time as our Artist-In-Residence comes to and end, I wanted to ask him some questions about his art and this piece in particular. Read on for our interview and some up-close shots of "Thieves", and be sure to follow him on Facebook and Instagram. How did you first discover painting? What do you enjoy about it? I start to draw when I was a child and I never stopped it. It’s my evasion [from] the real world and nowadays that makes me field like a child. I never thought to draw [as] a career, for that reason I started studying economics and spent all the lessons drawing. Two years after that I realized that [I was going] in the wrong direction, and then I decided to leave my career and start to study illustration and graphic design. Since this moment, my life changed completely. I [started] to meet a lot of new people who did the thing that I always loved, drawing. Then my motivation [started] to go up and never [stopped] until today. The formal training helps to improve your techniques and discover new ones, but I think that your personal experiences are the most important thing to grow you up as an artist and person. How do you come up with the ideas for your paintings? My father has been always a big nature fan, he had a lot of different species of birds and he loves all kind of animals. Since I was a little kid I’ve been [surrounded by] them. Our shelves at home were full of animal books and encyclopedias. I remember me on the sofa drawing in notebooks while my father shown me the black and white photos of hundreds of animals. I’m sure it all started here. When I see my old drawings (my mom kept all of them), I can see what I’m doing now, but with a [child's] language. When I was a child I wanted to study [to become a] veterinarian because I love the animals, but nowadays I can have them in my drawings. From the beginning of my existence, I have focused my work on the analysis of the conceptual development of the morphology of the wildlife. Right now I find myself in a stage where I am analyzing the situation in which these inhabitants of the planet are found, of whom we feel [we are] owners for no reason at all. I am not focused 100 percent on being an environmental advocate, it simply arises from within me; it is simply a subliminal message within my work. The constant environmental threat is present in my work. The representation of threatened animals and alteration of climate change in their natural habitats is something that fascinates me and studying [what] could happen in the future works as an advertisement of something that is on the way and what [it is] time to stop. I recognize that my works are not made for a purpose, but if they can work as a [criticism of] a very near future that we can still retouch then it's better for everyone. What was the most challenging part of this painting? Clearly the size, it's my biggest painting until the moment, I did tons of big murals around the world but never a painting in the studio with this kind of size. How is your process different when you do paintings vs. murals? The studio is where I create works that have another function, a function of lasting in time. They are different disciplines, a [street mural] is more spontaneous and the other is much more methodical, much more dedicated and where you are allowed a greater degree of control over the work. The street is exposed to all kinds of conditions much more difficult to control for someone like me. I like to have everything under control, perhaps that is why the studio allows me to work with more comfort. However, I need the side of the street to feel really free, it's another part of me. It was born as a rebellious part when I started to paint walls and is not the same [now], but it is similar. It makes me excel, grow and learn the same or more than in the studio. Working [on a] big scale is a way to test [myself], to see how far I can go, and I love that. How do you think your art has changed over the years? Art is constantly being born, art is influential for people each day more and more. Analyzing an artistic work is free and it is clear that only the people interested in it will do it, but I think each day the art is [becoming] more important in our society. The artist transmits his feelings as a necessity [for] himself, as messages that need to come out n the form of [his] works.